Update Newsletter (ESUN) is an online peer-reviewed newsletter that contains articles of interest to sarcoma patients and their caregivers, physicians, and nurses. ESUN has an outstanding Medical Advisory and Editorial Board and is a vital source of information for thousands of readers worldwide. The World Health Organization (WHO) classification system for cancer represents the common nomenclature for cancer world wide. In the United States, it has been adopted by the American Joint Cancer Commission (AJCC) for sarcoma staging and by the College of American Pathologists (CAP) Cancer Protocols for bone and soft tissue sarcomas. This common lexicon is critical for the performance of clinical trials, which are increasingly international in scale, and for translational research to be comparable. The WHO system helps to assure doctors and researchers that we are on the same diagnostic page in such undertakings. The fourth edition of the WHO Classification of Tumours of Soft Tissue and Bone “blue book” was published in February 2013. The new book surpasses the previous edition of the book published in 2002 in regards to its number of pages, illustrations, and authors. In all, 159 authors from 24 different countries contributed to this book. Eleven of them are the members of IARC/WHO committee for the International Classification of Diseases for Oncology (ICD-O). The editors of this volume are Christopher D.M. Fletcher (soft tissue), Pancras C.W. Hogendoorn (bone), Fredrik Mertens and Julia Bridge (genetics). "In keeping with the rapidly increasing knowledge and the extensive studies of the genetics of tumours that took place over the past decade, the new book has incorporated more detailed cytogenetic and molecular data." Of the major modifications made to the previous edition is the addition of three new chapters (gastrointestinal stromal tumours, nerve sheath tumours and undifferentiated high-grade pleomorphic sarcoma of bone). In keeping with the rapidly increasing knowledge and the extensive studies of the genetics of tumours that took place over the past decade, the new book has incorporated more detailed cytogenetic and molecular data. The grading of soft tissue tumours has always been a controversial issue. While the WHO does not strictly state a preference in grading systems, one of the major modifications that have been made to the current WHO classification is the designation of two distinct types of intermediate malignancy in terms of biological potential: the "locally aggressive" and the "rarely metastasizing." The authors acknowledged the poorly defined nature of malignant fibrous histiocytoma, MFH, (also known as UPS, undifferentiated pleomorphic sarcoma) and haemangiopericytoma (now considered within the spectrum of solitary fibrous tumor). With the current advances in molecular and genetic studies, a subset of tumours has been moved into new sections including angiomatoid MFH and extraskeletal myxoid chondrosarcoma which were reclassified under "Tumours of Uncertain Differentiation." Multiple entities were newly recognized, and a few entities belonging to tumours of skin were also added to this book. A few entities that were found to probably represent morphologic variants of other tumours were deleted from the current classification and subsumed into other sections. What follows is a series of brief highlights of this new WHO edition from each section of the soft tissue and bone sections. The current classification no longer includes mixed-type liposarcoma. Cases previously diagnosed as mixed-type liposarcoma were almost always discovered to fall within a specific type of liposarcoma when subjected to molecular and genetic testing. Myxolipoma was also deleted from the current classification. Most of the so-called myxolipomas are now considered variants of spindle cell lipoma. Diffuse lipoblastoma is now the preferred term for lipoblastomatosis. A description of spindle cell liposarcoma still appears in the text. The lack of MDM2 immunopositivity or 12q15 amplification in this tumor type suggests spindle cell liposarcoma represents a separate group. The new addition to this liposarcoma type is the recognition of the rare situation in which the high grade (dedifferentiated) component shows lipoblastic differentiation and resembles pleomorphic liposarcoma. This phenomenon has been referred to as “homologous lipoblastic differentiation” or “pleomorphic liposarcoma-like features”. The identification of MYH9-USP6 gene fusion as a recurrent event in nodular fasciitis has confirmed its previously controversial neoplastic nature. The term “haemangiopericytoma” was abandoned. It is used only to describe a morphological pattern that is shared by different entities. Currently, solitary fibrous tumour, haemangiopericytoma, lipomatous haemangiopericytoma and giant cell angiofibroma are all lumped under the “extrapleural solitary fibrous tumour” category. “Giant cell angiofibroma” is now considered a synonym for extrapleural solitary fibrous tumour rather than being a separate entity. Tumours previously called “giant cell angiofibromas” are characterized by the presence of multinucleated giant cells and pseudo-vascular spaces. This tumor is now known to be associated with a recurrent NAB2-STAT6 gene fusion. MUC4 is found to be highly sensitive and specific for LGFMS and linked to the presence of the FUS-CREB3L2 or FUS-CREB3L1 fusion genes. MUC4 immunoexpression is reported in up to 70% of cases suggesting that at least a subset are related to LGFMS, though genetic exploration indicates that this class is a minority. SEF-like areas can be seen in a subset of genetically confirmed LGFMS cases, but the characteristic translocation is seen in only a small subset of “pure” SEF cases (i.e., those that lack identifiable LGFMS-like areas). The malignant counterpart of so-called fibrohistiocytic tumours, formerly known as “malignant fibrous histiocytoma” and its subtypes was renamed “undifferentiated sarcoma” and reclassified under the undifferentiated / unclassified sarcomas section described further below. The most common translocation in tenosynovial giant cell tumour is found to involve CSF1 gene on chromosome 1 and COL6A3 on chromosome 2. Angioleiomyoma was reclassified under pericytic (perivascular) tumours. Cytogenetic analysis of several gene-expression profiling datasets identified multiple molecular subgroups of leiomyosarcoma, including a “muscle-enriched” subtype and less differentiated group with varying prognoses. Some tumours classified as UPS cluster closely with a subset of leiomyosarcoma suggesting the existence of “dedifferentiated leiomyosarcoma”. Myofibroma and myofibromatosis were reclassified under myopericytoma instead of fibroblastic / myofibroblastic tumours. Spindle cell / Sclerosing rhabdomyosarcoma was felt to now be well enough recognized and defined to be added to this group. Tumours with mixed embryonal and alveolar pattern were previously considered to be variants of ARMS, but most of these lack PAX3-FOXO1 fusions, thus appearing to be clinically and biologically more akin to embryonal rhabdomyosarcoma. Pseudomyogenic (epithelioid sarcoma-like) haemangioendothelioma was added to the intermediate (rarely metastasizing) subgroup. Two intermediate vascular neoplasms that the Working Group had previously considered for inclusion in the 2002 classification, namely giant cell angioblastoma and polymorphous haemangioendothelioma, were not added to the current classification due to the limited number of reported cases and lack of sufficient data. Recently, epithelioid hemangioendothelioma has also been shown to be associated with a WWTR1-CAMTA1 translocation. This chapter is a major and important addition to the new book. In the current classification, the benign category of GIST corresponds to the AFIP prognostic groups 1, 2 and 3a. The “uncertain malignant potential category corresponds to group 4, and the malignant category corresponds to groups 3b, 5, 6a and 6b. Malignant mesenchymoma is not included in the current classification. Most cases of malignant mesenchymoma reported previously probably represent heterologous line of differentiation in specific sarcomas such as myxoid liposarcomas with cartilaginous metaplasia, ALT and dedifferentiated liposarcomas with osseous, cartilaginous, smooth muscle or skeletal muscle elements, MPNST with heterologous components and others. This chapter was added to encompass a group of malignant tumours that were previously included in the fibrohistiocytic tumours, namely “malignant fibrous histiocytomas”. These tumours lack a specifically identified line of differentiation when analyzed by presently available technology. Dedifferentiated types of specific sarcomas are not included in this category. Undifferentiated/unclassified sarcomas account for up to 20% of all sarcomas and about a quarter of these are radiation-associated tumours. These tumours do not have distinct clinical or morphological characteristics that would otherwise place them under specific types of sarcomas. Genetic subgroups, however, are emerging within this family and this important work is ongoing. In this group, EWSR1 is involved in non-ETS fusions with genes such as PATZ1, POU5F1, SMARCA5, NFATC2 or SP3. Another recurrent rearrangement involves CIC-DUX4 fusion gene resulting in the chimeric CIC-DUX4 protein which upregulates genes of the PEA3 subclass of ETS family. It remains to be seen whether these cases represent one or more separate entities, or whether they are better classified as variants of Ewing sarcoma. UPS was most often called malignant fibrous histiocytoma in the past. Historically, many believe this entity is difficult to evaluate because of the shifting diagnostic criteria throughout the years. Analysis of 70 cases diagnosed as MFH of no specific type, storiform or pleomorphic malignant fibrous histiocytoma, pleomorphic sarcoma or undifferentiated pleomorphic sarcoma showed highly complex karyotype with no specific recurrent aberrations. Undifferentiated sarcomas with 12q13~15 amplification including MDM2 and CDK4 are best classified as dedifferentiated liposarcomas. The relationship between this tumor and the family of undifferentiated/unclassified tumors with spindle cell morphology above remains relatively undefined and is somewhat problematic in application at a practical level. The chondrogenic tumours of bone are now classified into benign, intermediate (locally aggressive), intermediate (rarely metastasizing) and malignant grades. The osteochondromyxoma, subungual exostosis, bizarre parosteal osteochondromatous proliferation and synovial chondromatosis were added to the benign chondrogenic tumours of bone. Chondromyxoid fibroma and atypical cartilaginous tumour / chondrosarcoma grade I are grouped together as intermediate (locally aggressive) tumours. Chondroblastoma is classified as an intermediate (rarely metastasizing) tumour. Enchondromatosis is discussed in the tumour syndromes chapter and not in this chapter. Osteochondromyxoma is a newly added extremely rare entity to the group of chondrogenic tumours of bone, associated with Carney complex. Bizarre parosteal osteochondromatous proliferation is a benign entity that was added to the group of benign chondrogenic tumours of bone. Chondrosarcoma grade I (now officially termed atypical cartilaginous tumour) is reclassified as an intermediate (locally aggressive) tumour, better reflecting its clinical behaviour. Secondary chondrosarcoma is currently subdivided into central (arising in a pre-existing enchondroma) and peripheral (juxtaposed to the cartilaginous cap of an osteochondroma) types. IDH1 and IDH2 mutations are found in primary, secondary central and periosteal chondrosarcomas as well as 50% of dedifferentiated chondrosarcomas. Mesenchymal chondrosarcoma carries a recurrent translocation resulting in a HEY1-NCOA2 gene fusion. Other than the addition of osteoma to the benign osteogenic tumours category, the classification has not changed. In conventional osteosarcoma, the authors give less emphasis on the detailed histopathologic subclasses and indicate that currently, there is no evidence of any relationship between these subtype and prognosis.IDH1 and IDH2 somatic mutations were found to be absent in all cases studied thus potentially helping to distinguish from chondrosarcoma where they are common. Giant cell tumor of bone is now considered a locally aggressive, very rarely metastasizing lesion. Malignant fibrous histiocytoma of bone was removed from the current classification. MFH of bone was renamed undifferentiated high-grade pleomorphic sarcoma of bone. The expression of brachyury is specific for notochordal tumors. Recent studies showed that IDH1 and IDH2 mutations are not detected in chordomas. These findings help to distinguish chordomas from chondrosarcomas. The new classification now recognizes epithelioid hemangioma as a separate entity that can occur, sometimes multifocal, in bone. EH can behave in a locally aggressive fashion, with (lymph node) metastases being rare. Cherubism, Li-Fraumeni syndrome and neurofibromatosis type 1 were added to this chapter, the latter two were previously dealt with in the WHO Classification of Tumours of the Nervous System. The introduction of this chapter demonstrates a table of hereditary disorders associated with tumours of soft tissue and bone. This table includes about seventy different tumour syndromes with known specific genetic involvement. Similar table in the previous edition included only twenty four congenital syndromes. This substantial increase in number of known hereditary diseases associated with mesenchymal tumours is largely due to the continuing rise in the identification of cancer-related germline mutations coupled with the increasing use and availability of molecular testing. This also allowed for the discovery that the prevalence of syndromes associated with heritable tumour predisposition is higher than was previously estimated. "This book will certainly serve as the basis for the classification of soft tissue and bone tumors for the next decade, when the next iteration of this classification process is likely to be published." With the recent widespread utilization of incisive technologies such as molecular genetic studies coupled with the continuing recognition and emergence of new entities, there is an increasing demand for pathologists to have consensus in regard to the classification, grading and staging of neoplasms. Since the very first “blue book” that was published about three decades ago, the World Health Organization Classification of Tumours book series has served as an indispensable reference for pathologists worldwide. The latest edition of the WHO Classification of Tumours of Soft Tissue and Bone is a comprehensive, yet concise reference book. It brings with it some fundamental as well as minor changes to the previous edition. This book is a product of collaboration of 159 authors from 24 different countries throughout the world. The book contains major modifications to the previous one through the addition of new chapters, inclusion of new entities as well as deletion and reclassification of others. It also demonstrated minor changes such as renaming of some tumours and updates of molecular and genetic findings as described above. This book will certainly serve as the basis for the classification of soft tissue and bone tumors for the next decade, when the next iteration of this classification process is likely to be published. Disclosure: Drs. 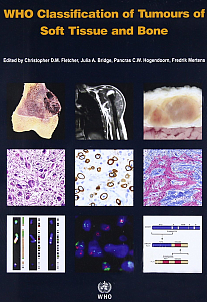 Lazar, Bovée and Hornick were an authors of multiple chapters on soft tissue and bone tumours in this book but receive no compensation from the sales of the book. This article is an opinion piece and has not been peer-reviewed. V10N3 ESUN. Copyright © 2013 Liddy Shriver Sarcoma Initiative.